PRP therapy is an effective non-surgical procedure that offers minimal downtime and improved results. PRP or Platelet Rich Plasma therapy is an alternative to surgical procedures that are expensive and painful as well. There are a whole lot of clinic in Sheffield that offers PRP therapy for hair loss. Regardless of age and gender this therapy works wonder on anyone who is suffering from hair thinning or male/female pattern baldness. PRP is a non-invasive out-patient procedure that is performed for an hour or two at the dermatologist’s office. As human blood contains red and white cells and platelets and for healing throughout the body it is the platelet that is responsible. Moreover, platelets also contain a significant amount of growth factor in it that can reverse hair loss. Patient between the ages of 20 to 70 years or patient suffering from hair thinning or baldness are some of the eligible candidates for PRP therapy. PRP therapy is an outpatient’s procedure in which a small amount of blood is drawn and then placed in a centrifuge. The centrifuge then separates various components by spinning the vial of blood at high-speed. The areas of the scalp will be numbed then the platelets rich with growth factor are extracted from vial of the blood and injected into the scalp with the help of a micro needling device. Patient suffering from systemic disorder, coagulation abnormality, and inflammation are not suitable for PPR therapy. PRP hair therapy is the most effective and long-lasting solution with which one can undergo other therapies as well such as Minoxidil and Finasteride. Regardless of ethnicity, gender or race PRP therapy is suitable for everyone. Men who are suffering from male pattern baldness or others can opt for PRP therapy. PRP hair therapy is suitable for women who are suffering from hair thinning or female pattern baldness, etc. PRP therapy is used to strengthen the existing hair follicles that utilize patient’s own blood. 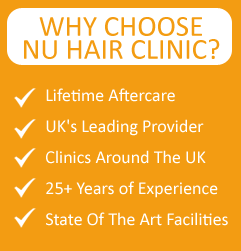 This procedure is available in various reputed clinics around Manchester, one such clinic is Nu Hair Clinic that offers state-of-the-art treatments such as PRP therapy to treat hair loss.